Gambia promotes government "homophobia" common in African countries. 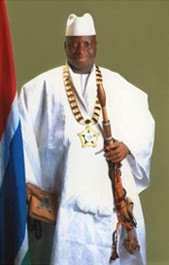 His Excellency Sheikh Professor Alhaji Dr. Yahya Abdul-Azziz Jemus Junkung Jammeh is the Commander In Chief of The Armed Forces and the Chief Custodian of the Sacred Constitution of The Gambia. President Jammeh is also the Minister of Defense of the African country of Gambia, reportedly refers to homosexuals as "vermins". After the "vermins" reference, my favorite line quoted from the speech is "...LGBT can only stand for Leprosy, Gonorrhoea, Bacteria and Tuberculosis; all of which are detrimental to human existence..."